And this refers to the land, the views, and the sense of place. You must get out into it, really into it, to experience its wonder. That's why we all exclaim, "NOW (!) we understand why Georgia came here. We understand why she had to live here, had to paint here, wanted it for herself." All of the cultures and peoples who have come to Northern New Mexico in its long and rich history have felt the same way, and we are no different. We want to be a part of this place, for as long as it will let us. Only 45 minutes from Santa Fe, and you are transported to some of the most beautiful sites in the world. Experience "a place between earth and sky!" 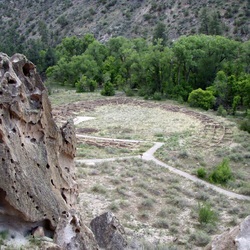 Puye is one of northern New Mexico’s most awe-inspiring cultural attractions featuring cliff & cave dwellings, early Pueblo architecture, an original Harvey House and a stunning panorama of the valley.